A colleague of mine, Ronda Zelezny-Green of GSMA, recently tweeted the following. Apparently, Zambia telecom Airtel Zambia announced that they will be rolling out a service which will allow users to access their Facebook accounts on their mobile phones without the need to have an active internet connection in place (via SMS). It seemed innocuous enough when I read it, but it had me thinking a bit more about SMS and the usefulness it still manages to demonstrate in spite of the more sophisticated technologies that come and go. So Airtel Zambia creating a SMS version of Facebook (good on them) makes one think it can’t be that difficult to do the same for most any other service. Google offers (or it did at some point) SMS equivalents of Gmail, Calendar, Blogger, and Twitter has a SMS version as well. There are other SMS blogging services and large writing communities dedicated to cell phone novels and composition. SMS is still strongly represented in mobile learning as a strong, massively accessible communications technology. So Airtel Zambia investing in providing a social media service made me think that developing a more complex SMS environment for learning as opposed to developing one-off SMS services for various social media might be a good idea. The last post in particular, I think, is useful for considering design issues. In that post, I was thinking that routing logic specific to the community would be useful in cutting through some of the complexity of larger SMS environments. In this structure, specific texted words would trigger specific menus or workflows that could be navigated. Building on this a bit, I am thinking it would be relatively easy to create a more accessible system of activity within a SMS-environment that would allow the learner to access their services for both informal and formal learning. I think part of the issue now is the development of these applications suffer from one-off syndrome, each beholden unto itself. This creates different workflows for different services, creating a bit of redundant activity. In the above example, the routing logic is generated from local context and would help the learner navigate towards a specific set of activities relatively painlessly. Building out from this, it stands to reason that these smart triggers for routing logic (localized in the local language) could be applied to a larger structure of learning activity, as illustrated below. This example is specifically for informal learning. 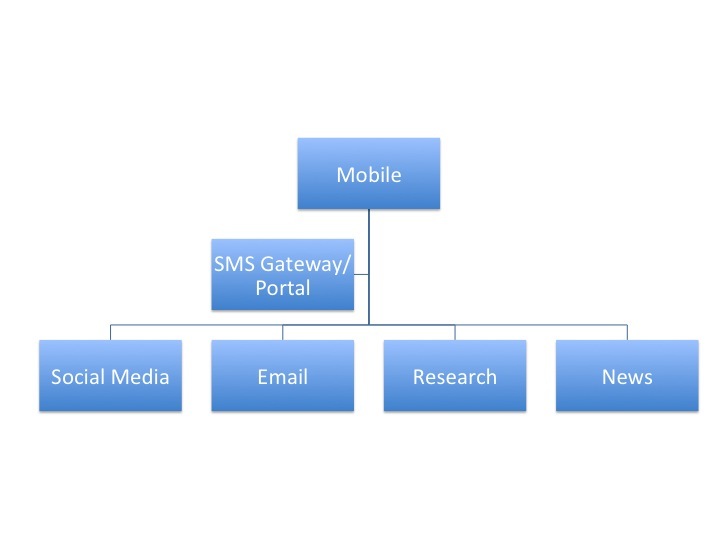 To keep the structure relatively accessible, I would first create a SMS environment as illustrated below, iterate based on use, apply smart routing logic after some participatory design sessions to elicit the appropriate words, and then add a parallel track of activity to support formal learning. 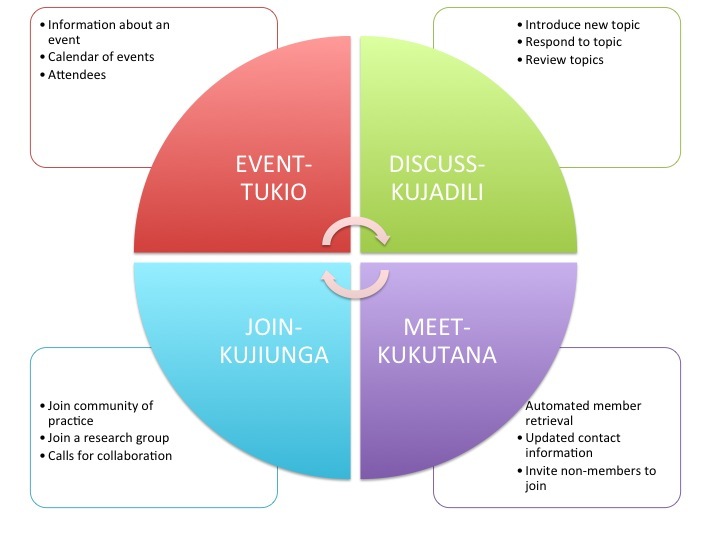 Beginning with the first stage of participatory design and informal learning, each output would be promoted, released, iterated, and trained on before adding the next track of activity. Releasing the entire thing all at once would, more than likely, lead to non-use. I would also like to iterate a few functions in there that allow for outputs to be shared, one for the formal learning track and one for the informal learning track. For the formal learning track, the teacher would have access to activity logs (perhaps formatted in a particularly useful way) as well as inputted assignments (blog entries, reflections, etc.). In the informal track, the learner would be able to share their notes, ideas, and subsequent compositions and projects with their peers (via SMS) and with their teachers. 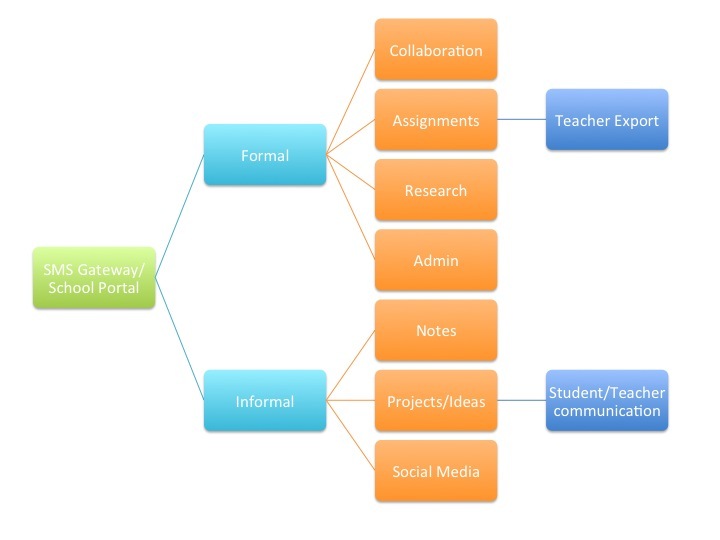 This is an attempt to explicitly bridge the informal to the formal and create a flow of activity between both. This could all be done, presumably, through a SMS gateway service or even through an appropriation of Frontline SMS. If this were to be a grant-funded project, the vast majority of the funds could be directed towards participatory design, training, and workshops as the development of the environment itself will have minimal costs associated with it (mostly time). The face to face sessions would be the connective tissue in which the use of the SMS environment would emerge. At heart, this is all still an exercise in communication, a human affair.